There is a critical shortage of affordable housing in our area (and around the country.) According to a recent report, an average of only 31 affordable and available rental units exist for every 100 extremely low income renter households. How can we end homelessness when adequate affordable housing simply doesn’t exist? 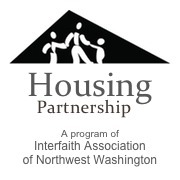 The Interfaith Housing Partnership (IHP) puts affordable housing within reach for working families in our community. Families who are living at The Family Shelter and who have income from employment can apply for the program. While in IHP, participants receive a monthly rent subsidy ranging from $50-$150, allowing their rent to be no more than 30% of their income. $150 may not sound like much, but this is often all it takes to place a family’s rent within the affordable range. Since its inception in 2006, IHP has been supported primarily through annual pledges of support from local faith groups. We of course welcome and appreciate support from individuals, but it is important to acknowledge that the backbone of this program is an inter-faith community of congregations committed to making a difference in the lives of families experiencing homelessness. While in the program, families work with a case manager who helps them gain the skills to move toward independence by staying employed, increasing income and continuing to meet the needs of their children. As a family moves further toward independence, their subsidy is gradually reduced to zero. With the skills and support they’ve gained along the way, they are often well on their way toward a bright, stable future. A number of years ago, a single father with two children came to live at The Family Shelter. Through job loss, family crisis and broken down vehicles he persisted in locating housing. The rent was almost within his family’s reach, but not quite. He needed a little help, so shelter staff recommended him for the IHP program. During his three years in the program, he maintained housing, found a better paying, more stable job and a reliable car. He went on to earn his Bachelor’s Degree, supported by his employer. With the help of IHP, he was able to move his family through a difficult period in their lives and achieve the stability and security he had always dreamed of for his children. ~ Introduce us to a friendly landlord. We are always looking for good placements for our IHP families.